Your iPhone's lockscreen shows you all kinds of useful information and buttons: the date and time, notifications, playback controls when you're listening to music. In some cases, the iPhone lockscreen just shows icons like different-colored batteries or a thermometer. Each icon gives you useful information—if you know what it means. It's important to understand what these icons mean and what you should do when you see them. In at least one case, it can save your iPhone from serious damage. 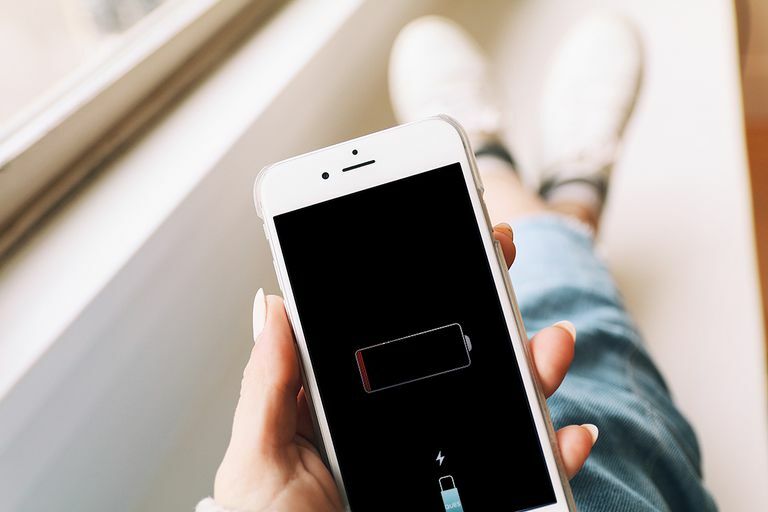 You will encounter a red battery icon on your iPhone lockscreen if it's been a while since you last charged your iPhone (check out this article for tips on how to make your battery last longer). If you do, your iPhone is telling you that its battery is low and needs to be recharged. The charging cable icon beneath the red battery icon is another hint that you need to plug in your iPhone. The iPhone still works while it shows the red battery icon on the lockscreen, but it's hard to know how much life it has left (unless you're viewing your battery life as a percentage). It's best to not push your luck. Recharge your phone as soon as you can. If you're not able to charge it right away, you should try Low Power Mode to squeeze more life out of your battery. If you're always on the go and can't always charge your phone, it might be worth buying a portable USB battery or a battery case to make sure you don't run out of juice. You won't see this icon on the lockscreen, but sometimes the battery icon in the top corner of the iPhone's home screen turns orange. This color signals that your phone is running in Low Power Mode. Seeing a green battery icon on your lockscreen or in the top corner of the screen is good news. It means your iPhone's battery is charging. If you see that icon, you probably know your iPhone is plugged in. Still, it's good to know to look for it in case you're trying to charge and something isn't working properly. Seeing a red thermometer icon on your lockscreen is uncommon. It's also a little scary since your iPhone won't work while the thermometer is present. An onscreen message tells you that the phone is too hot and that it needs to cool down before you can use it. This is a serious warning. It means that your phone's internal temperature has risen so high that the hardware could be damaged (in fact, overheating has been linked to cases of iPhones exploding). When the device overheats, the iPhone protects itself, according to Apple, by turning off features that could cause problems — including automatically stopping charging, dimming or turning off the screen, reducing the strength of the connection to phone company networks, and disabling the camera flash. If you see the thermometer icon, immediately get your iPhone into a cooler environment. Then shut it off and wait until it's cooled down before you try restarting it. If you've tried these steps and let the phone cool for a long time but are still seeing the thermometer warning, you should contact Apple for support.